The race for Hawaii governor between Democrat and former U.S. Rep. Neil Abercrombie and Republican Lt. Gov. Duke Aiona has been a contentious one. A stream of dueling press releases has dominated the headlines, political ads have blanketed the airwaves, and hordes of signwavers have lined nearly every street. But the latest battle in the state’s biggest race began on Twitter. Aiona claims that the Abercrombie campaign engaged in negative campaigning when its social media director, L.P. “Neenz” Faleafine, published links to a YouTube video and blog post that assert that Aiona is closely tied to the International Transformation Network (a.k.a. Transformation Hawaii, a.k.a. Hawaii He’e Nalu). The ITN has been linked to controversial statements about homosexuality and the practices of other religious groups. “Is Aiona lying about his ties 2 the Transformation Network..or did he just misspeak again and again..?” read one Twitter post, pointing to a write up by Honolulu blogger Ian Lind that prominently featured the video. “More about Duke Aiona and Transformation Hawaii, who for some reason changed their group name?” read a second post, linking to a write up by Bruce Wilson, the creator of the video in question. He called on his opponent to denounce Faleafine’s actions. Curiously, the Abercrombie campaign both defended and distanced itself from them. Abercrombie spokesman Laurie Au told the Associated Press that the video was not created by the campaign, and it was merely “rebroadcast” by supporters. She also said that Faleafine had posted the links to her personal Twitter account, rather than an official campaign account. “Our social media team, by sharing this information, did not engage in negative campaigning,” Au said. Negative campaigning was seen as one reason why Mufi Hannemann lost to Abercrombie in the primary (though I think social media was also a factor). Unfortunately, the strategy may have backfired. Aiona called out the Twitter posts as negative campaigning, but that label fits easily half of the television ads and mailers out there right now. Meanwhile, he has also called attention to what was previously a largely obscure allegation. Actually, Aiona’s links to the ITN had come up earlier this year, but were largely forgotten. Now the “larger media outlets” are again paying attention, two weeks before the general election. The YouTube video in question has been posted to Facebook dozens of times, and has over 11,000 views (up from about 3,000 when I first saw it earlier this month). The Huffington Post covered the story, but focused on Aiona’s ties to the ITN rather than the critical Twitter posts. Wilson has posted a detailed update on the issue, and was a guest on the Carroll Cox radio show this past weekend. Disclosure: I am not affiliated with the Abercrombie campaign, although I was previously part of the social media team and remain a supporter. Also, Faleafine is a friend of mine. She politely declined comment, but will surely have some great stories to tell after the election is over! Neenz was just posting relevant links to the issue. Many indi media had been drawing attention to Aiona’s scary affiliations an acts in official capacities for the past year. Carroll Cox did an exceelent job framing the issues and interviewing Bruce Wilson who did the very straight forward video postings. This is not about religion, it is mixing religion and government and being untruthful about associations that have agendas for religion in government. Aiona can clearly be seen saying it both ways depending on the audience. 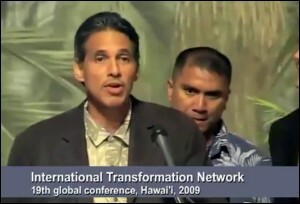 People can see for themselves: http://www.youtube.com/watch?v=qUIkBU27YaU He tells KITV “not a member” but says on stage “I am a part of a part of a prayer evangelization program called Transformation Hawaii”. Liar? Ed DeSilvoso responded to Civil Beat recently and the deflections abound. He repeats that Aiona is not “a member of ITN” but fails to clarify that Transformation Hawaii is the local chapter of ITN, again which Aiona, introduced as the Lt. Gov, says he is a member. Weasels. This story and the impacts of TH’s work go much deeper and are far worse tan have been covered by msm yet. Thanks for focussing on the social media aspect though. No religious test is required to hold any office in America, including a test to see whether a person is NOT religious. His religious views should have nothing to do with the campaign.